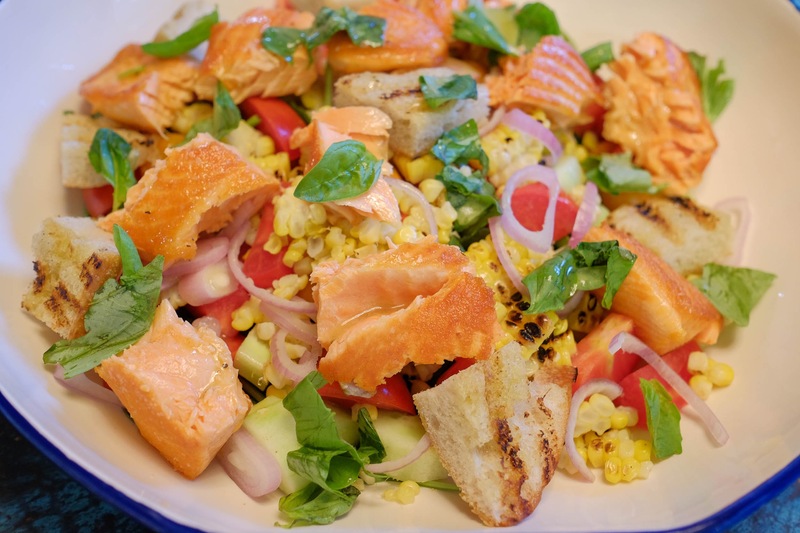 Grilled Corn and Salmon Panzanella Salad | What's for Dinner? Posted on September 24, 2017 by What's For Dinner? Whether fresh from the garden or straight from the farmers market, one of the BEST things about summer is the abundance of really good tomatoes! I just so happened to get my hands on some of the last tomatoes for this season and wanted to showcase them in a nice salad. With the temperatures still soaring well into the 90s here in Texas, it makes it hard to want to turn on the oven, so this is a meal you can prepare outside on the grill! Each ingredient in this salad stands out, so the key is to make sure you get REALLY GOOD “quality” ingredients…I, personally, like to use as much “organic” as possible. Grilled sweet corn makes an appearance along with grilled ciabatta bread (panzanella actually refers to a Tuscan salad with bread). Throw in some sliced English cucumber, thinly sliced shallots and fresh basil– then top it all off with some delicious New Zealand salmon (for you locals, Groomers Seafood is my favorite place to buy seafood, and they carry New Zealand salmon!) A lovely light champagne vinaigrette takes it over the top! 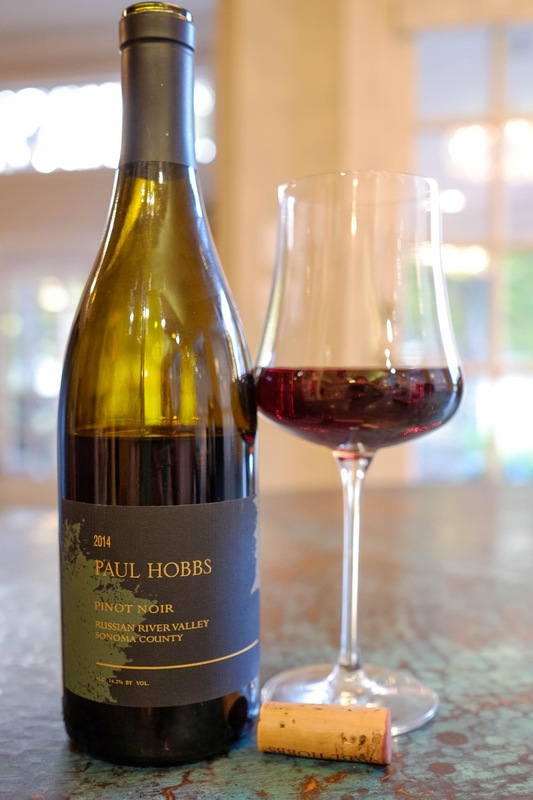 I served a 2014 Paul Hobbs Russian River Vally Pinot Noir…Fabulous! Brush bread with olive oil, salt & pepper and grill, cut side down, until you get some nice grill marks. Cut into bite sized pieces and set aside. Grill salmon to desired doneness, remove skin and break up into nice chunks. To assemble salad, put greens in a large bowl and add rest of ingredients. Drizzle with vinaigrette. For vinaigrettes, I like to add all my ingredients to a small mason jar, put on the lid and shake until combined. SOOO easy!!! You can leave any unused dressing in the jar in the fridge for several days. Instead of grilling a whole side of salmon, sometimes I’ll order (10 ounce) filets with the skin OFF from Groomers. I’ll brush with just a bit of olive oil, then pan sear them (in an oven proof, non-stick skillet) over medium high heat for about 2 minutes or until a nice crust appears. Turn over, and transfer the skillet to a 450 degree oven for maybe 3 minutes for medium to medium rare salmon. Leave a bit longer if you like a more well done result.